Every international traveler should visit Sri Lanka, the island country located in the Indian Ocean. The island has been a cultural crossroads since maritime trade routes led Europeans to India. Dominated by British rule for almost 150 years, Sri Lanka became an independent nation in 1948. From beaches to the mountains, tourists in Sri Lanka can enjoy it all. One of the places to visit in Sri Lanka is Adam’s Peak. Let Roughguides.com describes one of the most beautiful places in the country. A visit to Sri Lanka is not complete without an evening trek to the footprint located high atop Adam’s Peak, known to the locals as Sri Pada. Recognized as the holiest place on the island, this sacred spot is popular with both tourists and locals. If you choose to visit between December and April, you will likely encounter thousands of other visitors who are on a pilgrimage to pray at Adam’s Peak. These pilgrims are dedicated because it is an endurance hike up about 5,000 stone steps, and then you have to make your way back down again. If you do not have to stand in a long line for up to ten hours, the climb up only takes the average hiker about four hours to reach the top. With the crowds likened to a stadium filled with people in line for an event, the off season visit to Sri Lanka could be a wiser choice. Sharing the experience with the crowd will not detract from the beauty, but it might shatter your solitude and prevent you from reaching the footprint. To avoid that ten-hour line, be sure to avoid the Sinhalese New Year observed in April. The off-season months of May to November are less popular, and you might find solitude on the 7 km path. No matter when you visit Sri Lanka’s gem, Adam’s Peak, be sure to pack light. Essentials to take along are food, a sweater, gloves, and a jacket because it is cold at the top. Although it could be tempting to dress lightly, be sure to wear long pants and closed footwear because of the extreme temperature change. Upon arrival in Sri Lanka, you have transportation options for getting to Adam’s Peak. You can take a train or a bus, better known as a tuk-tuk to the locals. The train ride through the countryside provides you with a unique view of the area. It is the perfect way to see the sights while you visit Sri Lanka. Adam’s Peak is an unusual night time hiking excursion destination. Typically, hikers make the climb from Dalhousie to the religious location after dark. Adam’s Peak should be at the top of your list of places to visit in Sri Lanka because it is revered by a variety of religious believers. This religious destination is not just a worship location for Buddhists. It is also considered a holy place by Hindus, Muslims, and Christians. Each group has their own explanation for the footprint, an indentation at the top of the mountain peak. Christians and Muslims have a similar belief that the location is important as a place where Adam placed his foot after being exiled from the Garden of Eden. Buddhists believe that it is Buddha’s footprint. Muslims believe it is Adam’s footprint, and Hindus think Shiva is responsible for leaving the footprint. The location has drawn visitors for thousands of years. Be sure to follow in the footsteps of the masses as they show you where to go in Sri Lanka. The trek is lengthy and steep, but it is guarded by handrails. Follow the stone steps up the well-worn path that will take you to a breathtaking view and one of the most spectacular places to visit in Sri Lanka. If you are at the peak for sunrise, you are in for a treat! The Shadow of the Peak is visible for a short window of time in the early hours of the morning. It is a breathtaking sight to see the triangular shadow of the peak. The rising sun causes the triangular peak to cast a perfect shadow onto the clouds below. 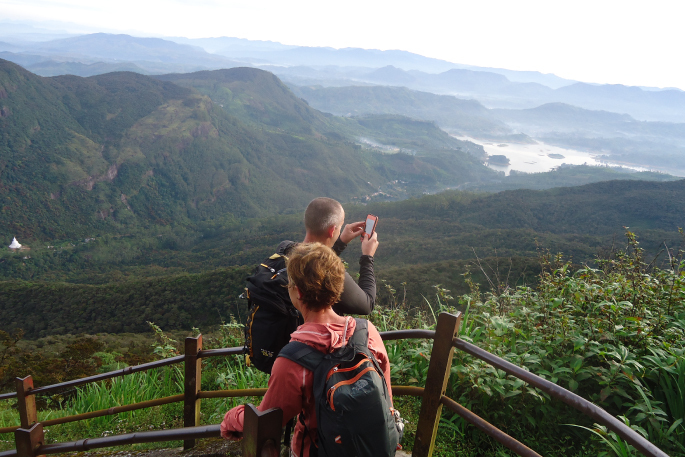 After you have taken in the view and returned from the top of Adam’s Peak, rest and relax at a tea plantation. The rooms in the plantation are of the highest hotel quality. Other hotel accommodations for the budget conscious traveler are available nearby. Sri Lanka has much to offer its visitors, and Adam’s Peak is a fascinating destination. What Is Mount Kailash and Why Make It Your Next Tour Destination?